200 new stores are expected to appear on 51.000 sq.m. lot in the Stochna Gara area in PLovdiv. The investors from ECE Projektmanagement GmbH and HSH Real Estate have already got their permit for the construction of the new "Trimontium Center" that is scheduled to take about 3 to 5 years. The new shopping center will be located at the corner of "Naycho Tsanov" Blvd and "Hristo Botev" Blvd in Plovdiv - on the place where a long row of old warehouses for construction materials, flour, etc. used to stand. 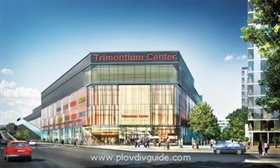 The new shopping center is designed to have a car park with about 1200 car parking spaces - more than are currently available at the Plovdiv Mall.